VANCOUVER , Jan. 23, 2019 /CNW/ - Boreal Metals Corp. ("Boreal" or the "Company") (BMX.V) is pleased to announce the completion of the 1,620.8 metre diamond drill program at its 100% owned Gumsberg project located in the prolific Bergslagen Mining District in southern Sweden (Figure 1). Boreal completed nine additional diamond drill holes in the vicinity of the past producing Östra Silverberg Mine. Diamond drilling tested prospective stratigraphy that is spatially separated from the historical mined orebody. Assay results from this program are expected imminently. "The Östra Silverberg Mine area contains high-grade precious metal enriched base metal mineralization," stated President and CEO Karl Antonius . "We look forward to the results from this round of drilling which follows up the high-grade zinc, silver, and lead intercepts from Boreal's 2017-2018 drill program. Arctic Drilling did a great job in completing the program ahead of schedule and under budget." 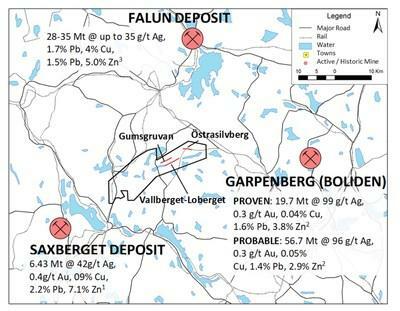 The strategically situated Gumsberg project consists of six exploration licenses in the Bergslagen Mining District of southern Sweden totaling over 18,300 hectares, where multiple zones of VMS style mineralization occur. The VMS mineralization at Gumsberg was mined from the 13th century through the early 1900s, with over 30 historic mines present on the property, most notably the Östra Silverberg Mine which was the largest silver mine in Sweden between 1250 and 1590. Despite its long-lived production history, relatively little modern exploration has taken place on the project. New geologic interpretations, geophysical surveys and reconnaissance drilling have led to the identification of multiple new exploration targets near the historic workings. Samples from the recently completed drill program at Boreal's Burfjord copper and gold project in northern Norway (see Boreal News Release dated December 3, 2018 ), have been received at the lab and are in queue for analysis. Due to the project's remote location in northern Norway , the core samples were first shipped to the Norwegian Geological Survey's facilities in Løkken, Norway for cutting and sample preparation. The samples were then imported to Sweden and shipped to the ALS Laboratories facilities in Malå, Sweden for further processing and analyses. Boreal is expecting assay results in February. Mineralization hosted on the Falun, Saxerget and Garpenberg properties is not necessarily representative or indicative of the mineralization hosted on the Company's Gumsberg property. 3 Kampmann, T.C., Jansson, N.F., Stephens, M.B., Majka, J., and Lasskogen, L., 2017. Systematics of Hydrothermal Alteration at the Falun Base Metal Sulfide Deposit and Implications for Ore Genesis and Exploration, Bergslagen Ore District, Fennoscandian Shield, Sweden. Economic Geology V. 112, pp 1111-1152. Approximately 28 to 35 million metric tons (Mt) of ore were produced from the Falun Mine at grades ranging between 0.5 to 5% Zn, 0.1 to 1.7% Pb, 0.7 to 4% Cu, 13 to 35 g/t Ag, and 0.5 to 4 g/t Au, varying between different mineralization types.